French postcard by E.D.U.G., presented by Corvisart, Epinal, no. 252. 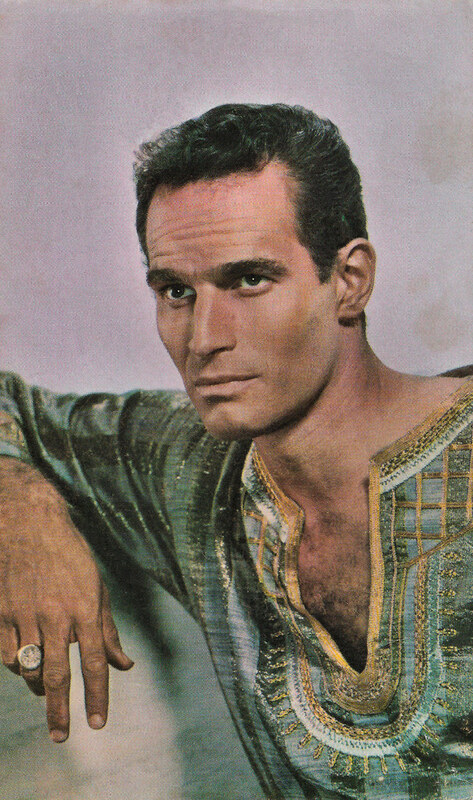 Photo: Charlton Heston in Ben-Hur (William Wyler, 1959). Tall, well built and ruggedly handsome American actor Charlton Heston (1923-2008) appeared in 100 Hollywood films over the course of 60 years. With features chiselled in stone, he became famous for playing a long list of historical figures, particularly in Biblical epics. His film debut was in the film noir Dark City (1950). His breakthrough came when Cecil B. DeMille cast him as a circus manager in The Greatest Show on Earth (1952). Heston became an icon for portraying Moses in the hugely successful film The Ten Commandments (1956). Furthermore, he is best known for his roles in Orson Welles’ widely acclaimed film noir Touch of Evil (1958), Ben-Hur (1959) – for which he won the Oscar for Best Actor, El Cid (1961), and Planet of the Apes (1968). These starring roles gave the actor a grave, authoritative persona and embodied responsibility, individualism and masculinity. Heston rejected scripts that did not emphasize those virtues. He was a supporter of Democratic politicians and civil rights in the 1960s, but eventually he rejected liberalism, founded a conservative political action committee and supported Ronald Reagan. Heston’s most famous role in politics came as the five-term president of the National Rifle Association from 1998 to 2003. In 2001, Heston made a cameo appearance as an elderly, dying chimpanzee in Tim Burton’s remake of Planet of the Apes.